Don't let your new gas grill end up in the trash. With the growing investment, a gas grill represents, it's increasingly important to keep your grill running longer. Of course, you keep it covered and clean at all times. Put it someplace sheltered when you aren't using it and give it a good washing after every use. Right? Well, whether you do or not something is bound to go wrong eventually. That's why it's better and cheaper for you to know how to make basic repairs of your gas grill. As gas grills become more and more complicated it can seem very daunting to attempt to repair one on your own. However, the basic design of gas grills really hasn't changed that much. Sure, there may be five burners where there used to be one. 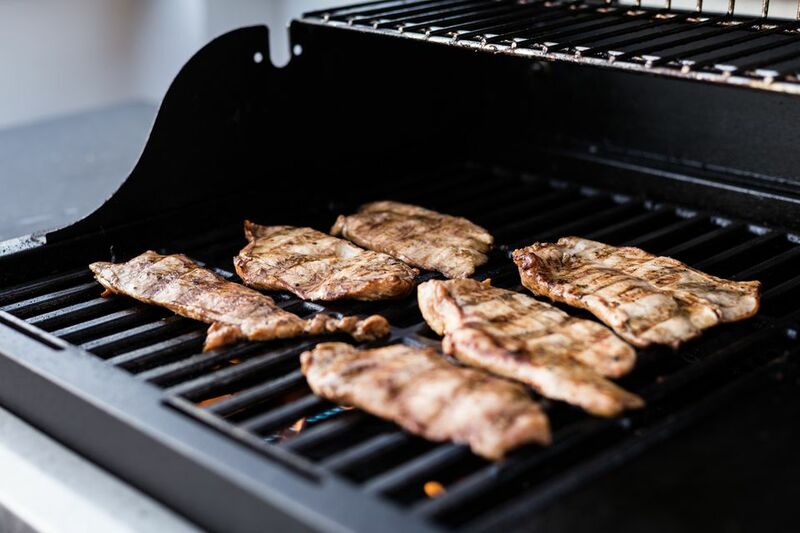 But most all gas grills are a metal box, either stainless steel or cast aluminum with burners, regulators, ignitors, and fittings that are pretty similar to those grills of years gone by. Gas starts out either in your tank or if you have a natural gas grill attached to your home from the gas line. The gas passes through a regulator (to limit the gas pressure), through a manifold to divide it up between the burners, then through the control valves where you adjust the flow rate to control the temperature. From here it passes through the venturi tubes to mix with oxygen so it can burn and finally into the burners and out through the burner ports to make the visible flame. Above the burners, you have some type of barrier that protects the burners and helps to distribute the heat. In the past, this barrier was typically lava rocks or ceramic briquettes (that some grills still use). The barrier catches drippings from foods so they can be burned off by the heat of the grill. Before you start pulling your grill apart be sure to open the lid, make sure that the fuel tank is in the off position and the gas disconnected. Propane and natural gas can be very bad for you whether there is an explosion or not. Now you're ready to get to work on your grill. The first step is determining if it's better to fix or replace. This is pretty much a personal choice. Many of today's lower end grills are much lower in quality than grills built 10 years ago. The drive to keep down cost and bring up profits has led many manufacturers to take shortcuts. Now you should be able to find parts for most any grill made in the past 10 to 20 years, so unless you have something very old or very unusual you will be able to get the parts you need online, though they may be very expensive. The big question you have to ask yourself is, "Does this grill meet my needs?" If the answer is yes then go on and get it fixed up. If the answer is no then you should start looking for a new gas grill. When a gas grill is working properly the flame is evenly distributed through the burners, the flame itself is blue with yellow tips and it should heat quickly on the high setting. With all burners on you should not be able to notice a difference in heat anywhere on the cooking surface. If this isn't how your grill works then you probably have a problem. To get you started let's talk a little about the anatomy of your gas grill. Years ago the propane tank of you grill was nothing more than, well, a tank. Modern propane tanks, mandated by the government for safety, contain an Over Fill Prevention (OPD) Device. This makes it so a propane tank can not be overfilled. The OPD on your propane tank can be damaged causing the tank not to work correctly. This is rare, but it does happen. The output of a propane tank or your natural gas line is much greater than you need for grilling so the regulator controls the amount of fuel that can flow to your grill. The regulator attaches to the tank (or natural gas line) by a flexible hose with an O-ring to create an airtight seal. Regulators are preset by the manufacturer and should not be adjusted by you. If you look at your regulator you will notice a small vent hole in the center. Common problems here are clogged vent holes, which can cause irregular fuel flow and can lead to trouble. Usually, you can clear it by tapping or blowing into the vent. Other problems are fuel leakage caused by a worn or damaged hose or O-ring. To determine if there is leaking mix dish soap and water in equal parts and coat everything from the tank to the control valves. The tank needs to be connected and on but the control valves off. If you find a leak replace that part. The controls do just that, control the flow of fuel to the burner. Each burner on your grill is going to have a control valve. The valve consists of several components that are specifically designed on a number of factors. You cannot repair a bad control valve and if need be, you should replace the whole unit. Before you do, however, remove the control valve from your grill and inspect it. Like other parts of your grill, insects love to climb in here and make their homes. At the heart of this is the orifice. The orifice controls the flow of fuel and can become clogged. If it is, use a thin wire to clean out. Make sure you put it all back together the way you found it. Without the orifice, you cannot control the amount of gas flowing to the burner and run the risk of explosion. The venturi tubes connect the control valve to the burner(s) and mix the fuel with air to provide the flame. To mix the air into the fuel there is an open gap in the fuel line here that can easily become obstructed. Insects, especially spiders, love this space and given half a chance will move in as quickly as possible. The best solution for this is to wrap the venturi tubes with an aluminum screen that will not block the airflow but will keep the critters out. These days many grills come with protected venturi tubes. Another common problem here is a misalignment of the venturi tubes with the burner. Typically the venturi tubes are simply placed in the fuel line and can get knocked out of place. The venturi tubes typically have adjustable shutters. You may need to adjust these to regulate fuel flow. Burners come in many shapes, sizes and materials particular to your specific grill. What the burner is made of will tell you pretty much how long it will last. Burners range from aluminized steel at the low-end to cast brass and stainless steel on the high end. Low end burners will typically last about 3 years under normal circumstances. Because the burner is inside the grill it tends to get coated in burnt grease and can corrode quickly. Inspect and clean your burner regularly to avoid problems. If the burner is damaged or too heavily corroded you will need to replace it. Get the same size and shape of the burner but consider purchasing one of a better quality metal if possible. In between the burner and the cooking grate is something. I call it a barrier; some people call it a radiant. It is called a radiant because it is supposed to absorb and release heat evenly to the cooking surface. However, I don't find it to be very good at this. The way I see it the barrier protects the burners from drippings and creates a place for grease to collect and burn off. Either way, what I'm talking about is lava rocks, ceramic briquettes or metal plates. These need to be replaced periodically as they become crusted in burnt grease and food and can create an unpleasant flavor on foods as they age. Lava rocks, because they are porous tend to need replacement more often. Metal plates can typically be cleaned and used for a longer time. Inspect your barrier. If it is broken up, heavily coated, or simply not creating a sufficient barrier, consider replacing it. The grill just doesn't want to heat up. This can be cause by several things. Taking it from the fuel source to the flame, lets start with the burner. Newer propane tanks contain a self regulating feature that will automatically slow down the flow of fuel if it thinks it's too high. This can be solved by turning the tank valve off completely and disconnecting it. Open the control valves (on the grill control panel) and ten close them. Reconnect the fuel tank and slowly turn on the valve. Now light the grill to see if that fixes it. Otherwise check the control valve(s) and venturi tubes for obstruction and alignment. Make sure that the flow of fuel is continuous. Check the burner for clogged gas holes. You can usually see this problem by observing how the grill burns. If there are spots without flame then you probably have a clogged burner. One side or one area of the grill is much cooler than the rest. This problem is similar to the low flame problem. Check there for solutions. If you have multiple burners determine if one burner is burning hotter than the other. The flame should be blue with yellow tips. If not, try cleaning the burner or letting it burn on high for 15 minutes. Venturi tubes may not be properly aligned. Venturi shutters might need adjustment. Do this by first locating the venturi tube adjustment screw. This screw releases the shutters. Light the grill and turn to low. Loosen the screw and open the shutters until the flame is mostly blue. Turn off gas and tighten the adjustment screw. Let the grill cool. There is typically a large build up of grease in your grill. Give it a good cleaning and preheat for 15 minutes to burn off any residue. This is caused by misaligned or blocked venturi tubes. After the grill is cooled, inspect to make sure all parts are fitting together. Make sure to check hoses and fuel lines to make sure they are not cracked, melted or burned through.